(l-r) Collegues from ABCUSD and Dr. Mary Sieu honored with the “2016 Protector of Children Award”. 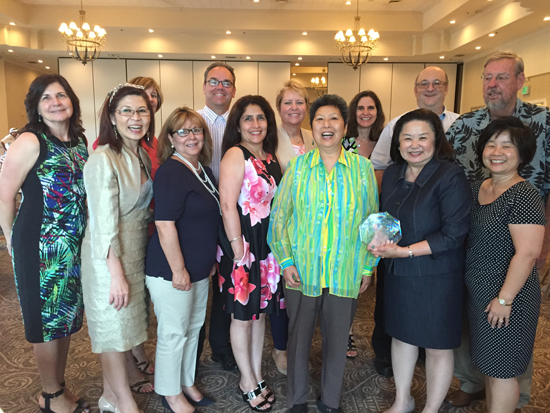 On June 27, 2016, Dr. Mary Sieu, Superintendent of ABC Unified School District was honored by the Community Family Guidance Center with their “Protector of Children Award”. The event was held at the Los Coyotes Country Club in Buena Park. The Awards Dinner followed their annual golf tournament to support the Community Family Guidance Center. The recipient of last year’s Award was L.A. Supervisor Don Knabe. In accepting the Award, Dr. Sieu shared the strong partnership that ABC Unified School District has with the Community Family Guidance Center in providing mental health services for students and families in the District. The Community Family Guidance Center is part of ABC’s Community Resource Team that provides intense levels of support for students who experience trauma, depression, suicide ideation, and other socio-emotional issues.